The most important thing you can possibly do to have a great career is to know yourself. Research shows that the best leaders in the world don’t have anything in common, with the exception of this one thing — they’ve redefined “success” to mean “self-awareness.” The more we understand ourselves and apply that knowledge in a productive direction the more successful we will be. Talent is the naturally occurring patterns of behavior we each have, allowing us to effortlessly do some things excellently almost every time. 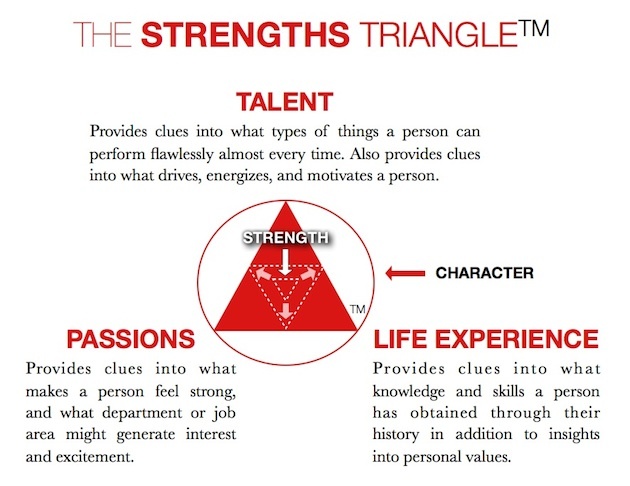 The best way to uncover your innate talent is through an assessment like the Clifton StrengthsFinder™. Life Experience is made up of the things you know, the skills you’ve gained, and the experiences you’ve had that make you, you. It is the cumulative image of all the formative events in your life, your family background, schooling, etc. Passion is what makes you get out of bed in the morning. It’s whatever makes your heart beat a bit faster. It’s what you love. These are the things that, when you do them, they never feel like “work” — even if they’re part of your job. Feel free to post any questions below. Also, don’t forget to stop by the terrific social community Brazen Careerist: the kind sponsors of the video above and a community of sincere individuals engaging in meaningful conversations about the world of work. Please consider this your official invitation to join if you’re not already a part! What if you focus on those 3 things…but don’t have ambition? I would think that passion and ambition would go hand in hand, but I’ve seen some cases where it does not. Advice? Great question, I had to think about this one. I definitely know some people that are like you describe… they seem to get excited about certain things but lack any ability to follow-through. I’m not sure I can separate passion from ambition, though. Simon Sinek has a great quote where he says: “What you do simply proves what you believe.” I’d would really question how passionate a person REALLY was if they showed no ambition in that area. The way I define it, there’s a component of “activation” in passion that provides intrinsic motivation. If it doesn’t have that, I’m not sure it meets my definition. Also, I’m fairly pragmatic in this area — I believe we make time for the things we want to make time for. This is obviously more complex than it looks, but I think it’s true deep down! Not sure that was helpful at all… ha! Your thoughts? I can’t emphasize how much knowing my strengths have positively affected me as a leader. Your strengths actually reveal and refine your style. Using that triangle helps you figure out what you should be doing. My advice to you is, if you haven’t taken the StrengthsFinder, buy it on Amazon today! It’s completely worth it! Thanks Scott — I totally agree, of course. Like going to the gym, this is one of those things where you will only get out what you put in. But wow, the returns are spectacular! Thanks for the post! A great way of identifying talents is through the Highlands Ability Battery – much more thorough than Strengthsfinder and empirical to boot! This comment is borderline spam-ish for me, “Joe,” but I’m going to allow it here because you’ve reminded me of a point I forgot to make. I did mention the Clifton StrengthsFinder™ in the post (and I love it because it has helped me a great deal, personally) but I could not care LESS what assessment a person or organization uses — as long as they are using it to focus on increasing positive human behavior. As long as we continue to shift our perspective towards what is RIGHT with people instead of what’s WRONG — and using our knowledge to build more healthy, happy work environments — I am all for it.